including heart rate dection, blood oxygen detection, blood pressure detect, pedometer, and so on. It is made of plastic and aluminium alloy, providing excellent dustproof and waterproof quality. What's more, you can even adjust your sleep time and improve your sleeping quality with the smart sleep monitoring. - Material: Plastic, Aluminium Alloy. - System requirements: Android 5.1 or above, iOS 8.0 or above. - Standby duration: 15 days. - Operation duration: 7 days. 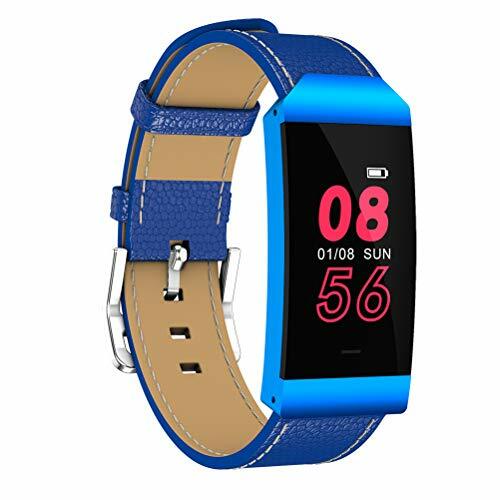 Provide heart rate detection, blood oxygen detection, blood pressure detection. Fitness functions: Pedometer, calorie consumption, distance calculation, health goals. Professional dustproof and waterproof, suited to various environments encountered. Smart sleep monitoring: help you adjust sleep time better with automatic tracking function. Support Android 5.1 or above, iOS 8.0 or above, leather material very comfortable to wear.